SYDNEY (Reuters) - The leaders of Australia and Singapore closed a regional summit on Sunday with a stand against against protectionism, arguing in favour of multi-nation trade deals as fears mount that U.S. plans for new tariffs could stoke a global trade war. "We strongly believe that a free, open and rules-based multilateral trading system is key to the region's growth and prosperity," Singapore's Prime Minister Lee Hsien Loong said at a news conference to mark the end of a summit between Australia and the Association of Southeast Asian Nations (ASEAN). President Donald Trump announced the tariffs on March 7 to protect domestic steel and aluminium producers on national security grounds. The United States is also looking at tariffs on up to $60 billion worth of Chinese imports, targeting technology and telecommunications sectors. Lee and Turnbull urged ASEAN to speedily agree to the Regional Comprehensive Economic Partnership, a China-backed alternative to the Trans-Pacific Partnership (TPP) trade pact that Trump withdrew the United States from last year. "If we secure a good agreement, this would be, as one of our colleagues said this morning, an antithesis of protectionism, it would ensure, on the back of the TPP-11, that the Indo-Pacific continues to be the fulcrum of open and free trade," Prime Minister Malcolm Turnbull said. 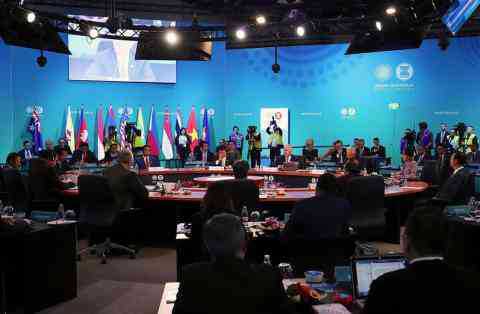 Officially, the summit was focused on fostering closer economic ties among the members of ASEAN and Australia, and countering the threat of Islamist militants returning to the region from the Middle East. Australia hosted the weekend meetings despite not being a member of the 10-nation bloc, aiming to tighten political and trade ties in the region amid China's rising influence. In a joint communique issued at the conclusion of the summit, ASEAN and Australia also called for "self-restraint" in the South China Sea, where aggressive Chinese expansion has irked ASEAN members. "We emphasise the importance of non-militarisation and the need to enhance mutual trust and confidence, exercise self-restraint...and avoid actions that may complicate the situation," the communique said. ASEAN members Brunei, Malaysia, Vietnam, the Philippines, also have claims in the important trade waterway that is mostly claimed by China, which has been building artificial islands on reefs, some with ports and air strips. "This is a security and stability question in Southeast Asia which will affect all ASEAN countries if it goes wrong," Lee said. ASEAN also called for the "complete, verifiable and irreversible denuclearisation of the Korean Peninsula" and urged all U.N. members to strictly apply Security-Council sanctions on North Korea. Earlier in the summit, ASEAN and Australia announced new measures to co-operate on counter-terror intelligence.